This Humphrey Bogart Lookalike Impersonator will catture one of the most famous and enduring leading men in Hollywood and movies history. His signature roles as ‘Rick” from “Casablanca” ( One of the AMI”s top 10 movies of all time! ) and “Sam Spade” of “The Maltese Falcon” made him one of the very first super- superstars!….and in case you didn’t know, Humphrey Bogart was the founder of the famous “Rat Pack,” way before the Las Vegas guys of Frank Sinatra, Dean Martin and Sammy Davis Jr.. So, if you’re gonna swing with any kind of “Rat Pack” entertainment, you’ve got to have the grand daddy and president of the Rat Packers there to keep them in line! Our “Bogey” has performed for many “Casablanca” theme parties and fundraisers in that highly romantic adventure drama role…instantly recognized in these appearances…Invite Humphrey Bogart Lookalike Impersonator to your next event. A talented Humphrey Bogart impersonator that is great for corporate & private events, company picnics, trade shows, clubs, fundraisers, & advertising. 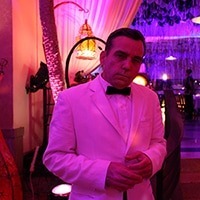 Casablanca themed events mush have a Humphrey Bogart Celebrity Lookalike Impersonator. He is an accomplished impersonator not only looks like the performer, he has captured Humphrey Bogart’s voice and mannerisms as well.